Jacquemart de Eden refers to the big the masters of Miniature. Worked in the morning in 1384 - 1409. 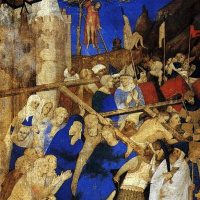 Preserved his parchment pasted on canvas "Christ carrying the cross"of the Luxurious book of hours of Duke Berry. It was completed by the author in 1409. The work was acquired for the Louvre in 1960. In the painting Christ carries the cross, helped by Simon.